Archaeologists unveiled the vividly painted tombs of two scribes from the Old Kingdom (2686 – 2160 B.C.) in the necropolis of Saqqara, outside of Cairo. The tomb of the father, Shendwa, was unplundered, a rare discovery indeed in Egypt, but unfortunately the wooden sarcophagus had decayed from humidity and erosion. The tomb of the son, Khonsu, had been plundered of its valuables in antiquity. The paintings decorating the false doors of the tombs, however, are in absolutely glorious condition, the colors fresh as the day they first dried. 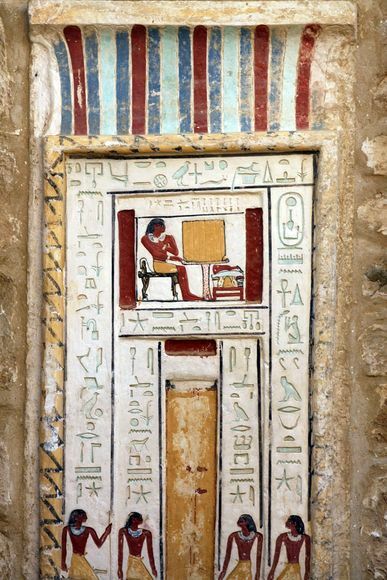 Consisting of a false door with paintings depicting scenes of the deceased seated before an offering table, Shendwa’s tomb featured inscriptions with the different titles of the tomb’s owner. According to the inscriptions, Shendwa was a top governmental official during the Sixth Dynasty (2374-2191 B.C.). He was the head of the royal scribes and the supervisor of the missions managing the materials used for pyramid construction. Beneath the false door, 20 meters below the ground level, the archaeologists found the burial chamber. 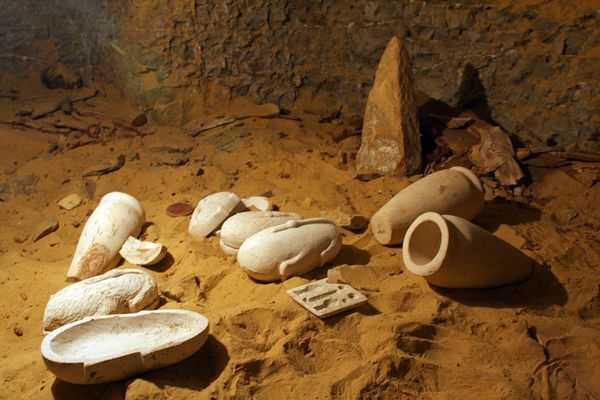 Limestone jars and offering vessels were also found in the burial chamber of Shendwa’s tomb. Some were in the shape of ducks and contained duck bones. There was even an obelisk. The tombs were found in the royal burial ground of Saqqara, which underscores Shendwa’s political importance. Inscriptions describe him as Shendwa and Khonsu as not only royal scribes but also “supervisors of the mission,” ie, in charge of supplies and materials for the construction of pyramids. The Old Kingdom’s pyramid-building days were begging to decline already in the 6th century, but supervising their construction was still an apex job. Pepi II’s name was engraved on Shendwa’s false door, but they were located far from the tomb of the pharaoh he served. In fact the archaeologists never expected to find burials from the reign of Pepi II in that section of the necropolis, because usually the subjects’ tombs are in as close proximity as possible to their bosses’.